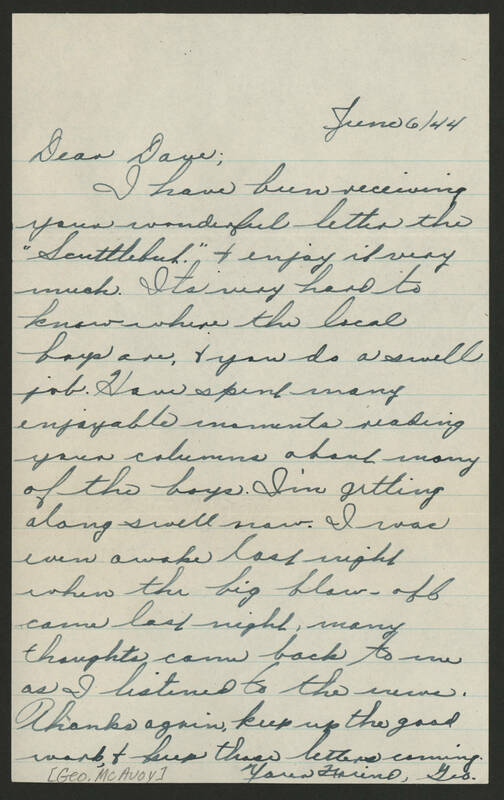 June 6/44 Dear Dave; I have been receiving your winderful letter the "Scuttlebut." and I enjoy it very much. Its very hard to know where the local boys are, and you do a swell job. Iave spent many enjoyable moments reading your columns about many of the boys. I'm getting along swell now. I was even awake last night when the big blow-off came last night, many thoughts came back to me as I listened to the news. Thanks again, keep up the good work, and keep those letters coming. Your Friend, Geo.